Heat oven to 400°F. Line 2 cookie sheets with cooking parchment paper. To make square-shaped pocket tarts, unroll 1 pie crust onto cutting board. Using pizza cutter, cut pie crust to make 1 large square. Cut square into 3 1/2x3 1/2-inch squares. Repeat with second pie crust. To make rectangular-shaped pocket tarts, unroll 1 pie crust onto cutting board. Using pizza cutter, cut pie crust to make 1 large square. Cut square into 4x3-inch rectangles. Repeat with second pie crust. 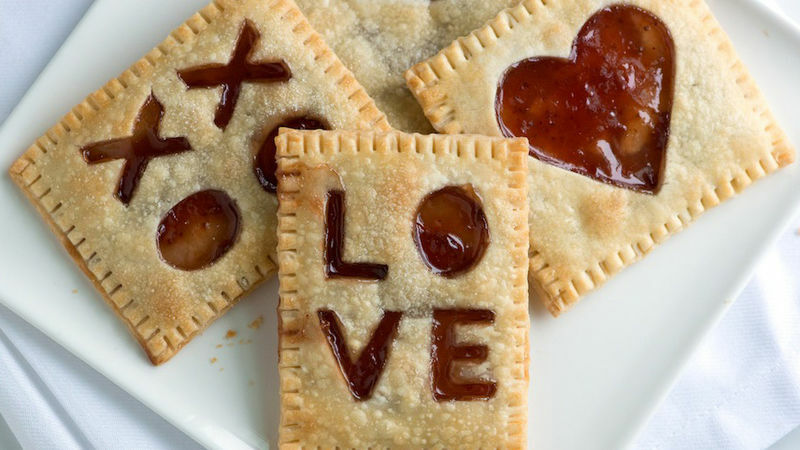 To make each pocket tart, place 2 teaspoons of strawberry jam in center of remaining dough squares/rectangle. With table knife or small spatula, spread jam into thin layer to within 1/4 inch of edges. Place 1 cut-out dough square/rectangle over jam; press edges to seal. Use fork to crimp edges. In small bowl, beat egg and water until well blended to make an egg wash. Lightly brush top of each pocket tart with egg wash. Sprinkle sugar over each. Place on cookie sheets. Refrigerate 10 minutes. Use different shaped cookie cutters to match your occasion. If you cannot find letter-shaped cookie cutters, you can make a template at home. Choose a thick font and make sure the size of your font will fit within the size of your pocket tart. Print out the letters and cut them out. Then, place the template on top of your piece of dough and use a paring knife to carefully cut out the letters.